Michelle from Through Michelle's Lense is a follower of Love Actually and just so happened to do the "12 Lays of Christmas" for her hubby. He loved it so much that she decided to create another version of the 12 lays....this time for Valentine's Day! 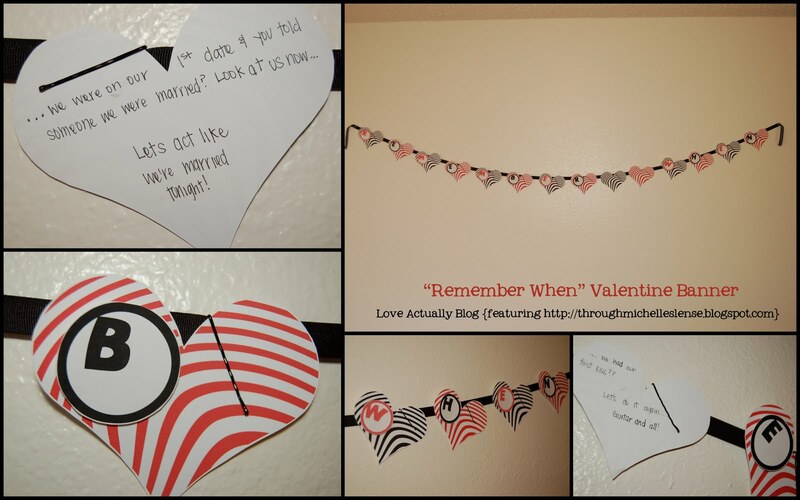 I have been reminiscing on some of our fun memories lately, and thought it might be fun to incorporate them into this idea. 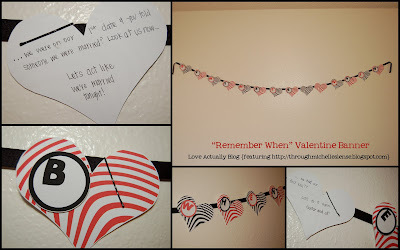 I made a banner that said "REMEMBER WHEN" (with one letter on each "pendant"). I wanted to do it for the 14 days leading up to Valentine's Day, so I added 2 blank spaces between the two words. On the back of each heart pendant, I wrote a memory, and then a way to reenact it, or spice it up a bit that night. Michelle used the free heart printable from TomKat Studio. What a fun, inexpensive and creative idea that even the most macho of husbands might just love! Thanks for sharing, Michelle! Don't forget to enter the giveaway this week. $30 Vinyl Lettering/Decor Giveaway from Say It On The Wall. Go HERE! WELL...this is the cutest idea ever! I may try to do this, too, if I can find the time with my crazy toddler and 6 month old ruling my days - haha. Thanks for sharing, I really love it! ...you taught me to play the drums? Teach me something new tonight! ...we snuck up to Bear Lake? Let's be sneaky tonight! ...you took me to Paris on our honeymoon? (Paris Hotel...) Let's act like we're on our honeymoon tonight! Only this time, you pick out something for me to wear! I love it! Definitely going to use this! I love this! I will try my hardest to make my "remember when" banner just as cute as yours!! This is exactly the idea I've been looking for! (I just didn't know it!) It's perfect. Thank you so much for sharing!